High blood pressure values are recorded in almost 50% of patients with cardiogenic pulmonary edema. Not in all of these cases hypertension is the primary cause of the event but rather an associate and aggravating factor, except for “hypertensive pulmonary edema.” Usually, patients presenting with this condition have a long history of uncontrolled arterial hypertension, with left ventricular hypertrophy and preserved ejection fraction. Signs of myocardial ischemia are lacking, and the clinical evolution is typical for flash pulmonary edema (FPE): sudden and severe flooding of pulmonary alveolar spaces, with rapid recovery after the onset of treatment. 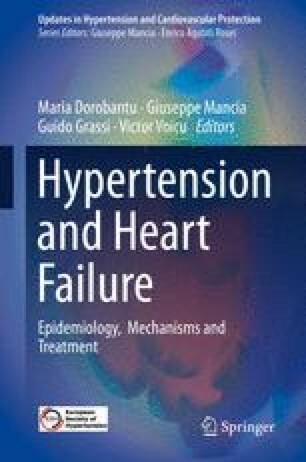 Multiple mechanisms are involved in the occurrence of hypertensive FPE and will be detailed in this chapter. In front of a strong vasoconstriction, a left hypertrophied ventricle with reduced myocardial strain fails to adapt its stroke volume with subsequent activation of sympathetic system and rise of left ventricular filling pressures. In FPE, the abrupt increase of pulmonary capillary pressure, in conjunction with neurohumoral mediators, are inducing pulmonary capillary failure characterized by a higher permeability of blood-gas barrier than in other forms of hemodynamic edema. Moreover, myocardium of the right ventricle increases its contractility through sympathetic activation and an additional Frank-Starling mechanism, favored by the splanchnic reservoir translocation. Altogether, these adaptive processes are conducting to a mismatch between right and left ventricle stroke volume. One specific connection between arterial hypertension and FPE is represented by the atherosclerotic renal artery stenosis which will also be addressed in this chapter.